A Richard Strauss song caught me unawares. It was my father’s favorite song. Through music that he loved. Written over half a century, Wiener’s fifty poems narrate the stories of his life, from experiences of the stirrings of the Holocaust, to bereavement, to the exploration of the different emotions that visit the enamored heart. 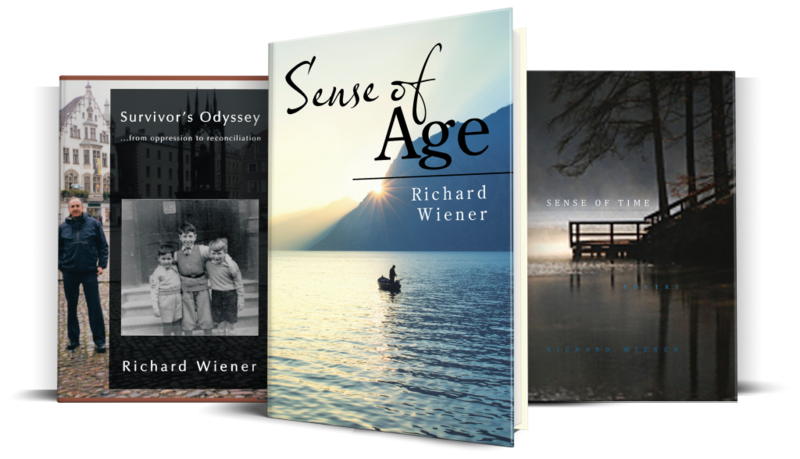 Affirming their biographical tokens, the pieces reflect Wiener at different times of his life, early poems manifesting the insouciance of youth that gradually evolves into poetic solemnity that comes with having acquired much experience of the world. Meanwhile, each piece gradually gravitates toward the collection’s primary theme of time and change. “Survivor’s Odyssey” recounts the author’s journey from racial persecution in Nazi Germany to ultimate life affirmation. He takes the reader step by step through the stages of his liberation from victimhood, starting with his childhood as the only Jewish boy in a school of Hitler Youths, through exile, exploration and a restless search for acceptance, to final reconciliation with his childhood persecutors. His story demonstrates that our past, no matter how painful, can help us to face our own shadows, and to achieve compassion for the sufferings of others. Copyright © 2017. Richard Wiener. All rights reserved.